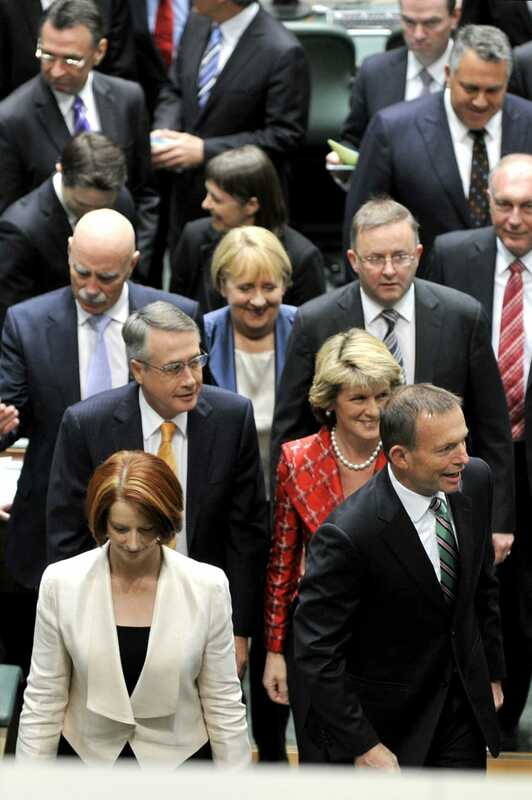 Remember Australia's Last Hung Parliament? It got a bit done. 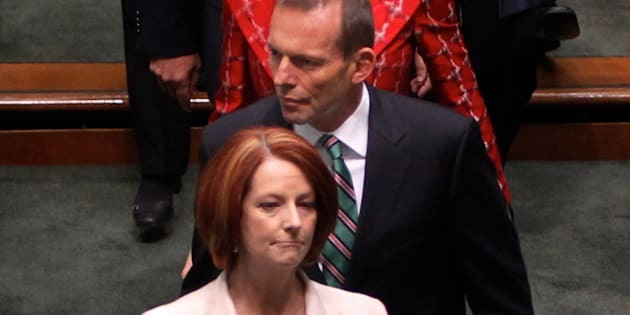 Prime Minister Julia Gillard and Opposition Leader Tony Abbott at the opening of the 43rd Parliament. The last time Australia had a hung parliament, it actually achieved a lot. Shortly after Julia Gillard knifed first-term Labor Prime Minister Kevin Rudd in 2010, she called a general election, which resulted in a hung parliament. With each side only achieving 72 seats in the lower house, below the 76 needed to form a majority, Gillard relied on the votes of The Greens, as well as independents Rob Oakeshott and Tony Windsor, to pass a raft of legislation that made the 43rd parliament not only the most dramatic, but arguably the most legislatively productive, in the country's history. So with a hung parliament once again on the cards in Australia, we thought we'd revisit some of the controversial, big ticket legislation that was dropped between 2010 and 2013. Say what you want about that uncertain time, Gillard's minority government enabled more than 500 pieces of legislation to pass. 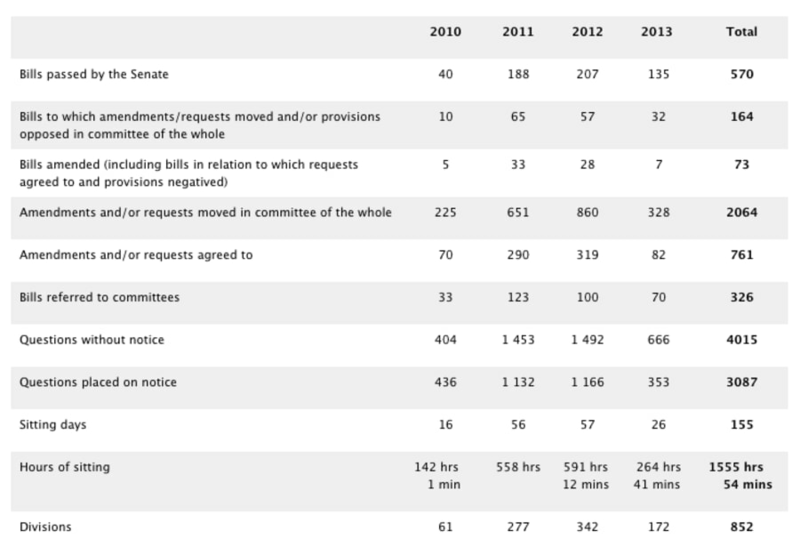 More than one in five of these pieces of legislation were opposed. The Carbon Tax: Despite election eve promises she wouldn't do it, Gillard introduced a carbon pricing scheme to take effect on July 1, 2012. The introduction of scheme eventually proved to be a major factor in Gillard's undoing, leaving her open to repeated attacks from her Coalition successor Tony Abbott. The carbon pricing mechanism was repealed, with effect from 1 July 2014. The Gonski School Funding Arrangements: The plan was for school funding to be increased by $14.5 billion over 6 years, with $12 billion to be directed to public schools. The Abbott Government cut the funding promised to the states and territories by $3.8 billion in 2018 and 2019. In May the Turnbull government promised an extra $1.2 billion in schools funding to be spread over 2018, 2019 and 2020. The opening of the 43rd parliament, in September 2010. In the foreground are then-Prime Minister Gillard and opposition leader Tony Abbott. The next three years would be among the most dramatic in Australia's political history. The Murray-Darling Basin Plan: A scheme to secure the long term ecological health of the Murray-Darling Basin, the plan passed its last hurdles in the parliament in November 2012. Manus Island and Nauru: Kevin Rudd may have toughened Australia's immigration stance, but it was under Gillard that negotiations to reopen the Manus and Nauru detention centres were finalised before they both eventually re-started operations in 2012. The National Disability Insurance Scheme/ DisabilityCare: The bill for the NDIS was first introduced in November 2012. The NDIS aims to support Australians under the age of 65 who live with a permanent and significant disability, as well as their carers. The NDIS began to be rolled out across the country last week after a series of successful trials. The Royal Commission Into Child Sexual Abuse:In November 2012 Gillard announced she would be recommending to the Governor-General a Royal Commission into Institutional Responses to Child Sexual Abuse be set up. So far the commission, which has probed dozens of religious and state institutions of various faiths and creeds, has referred 1,606 matters to authorities. Plain Packaging For Cigarettes: The 43rd parliament managed to get the ugliest colour in the world (a sickly olive green, called Pantone 448 C) passed into law, forcing all cigarette companies to bear plain packaging and cover up their brand. It was enacted in December 2012. The Parliamentary Budget Office: Established in July 2012 as part of a deal with cross benchers, the role of the PBO, according to its website, to inform the Parliament by providing independent and non-partisan analysis of the budget cycle, fiscal policy and the financial implications of proposals. RT "@GinoMandarino: The Proclamation dissolving the 43rd Commonwealth Parliament. #auspolpic.twitter.com/wxLD2pZ993"